Upload your level here when it's done. I posted about this on Nifflas' Support Forum, which has become more active recently! I'm hoping this event really takes off. Heyo! Came here from the Nifflas Support Forum. Will be taking part in this. neat! glad to hear it! Aw, man, I gotta get ready for this. I made it in 2hours 15 minutes. I just finished it. Hey! I'm the author of the tileset you used for the majority of the level. I love seeing it get used, contributing art to Knytt Stories all those years ago is truly the gift that keeps on giving. This is a really nice level and I'm impressed by how much you were able to achieve in the time limit, it's so much more than I can typically manage. It all feels really cohesive. I was floored by your innovative use of Tileset55 in the subterranean area, too. If you're willing to update the level (and I really hope you are) I have a lot of bugs to report and other tips, so brace yourself. Many enemies in Knytt Stories will walk on air if there aren't walls at the edge of a platform, and you kind of have to design around this. Screens where this happens are x1001y1000, x1000y1001, and x998y999. There are several areas where the alternate yellow-green tiles are used at the edge of the stone tiles. I guess this might be intentional, but I thought I'd point it out since I don't really like the look of it. Affected screens include x1001y1001, x1000y1001, x999y1001, x998y1000, x997y1000, and x997y1001. 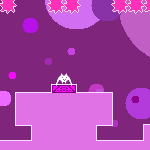 The spiky purple enemy on x1001y1001 seems impossible to get past for me, I can only jump over it when I have the high jump. Replace it with an easier foe or tell me what trick I'm missing, please! The Knytt Stories engine can't handle walls that don't directly connect between screens, so sliding down the steps in x999y1000 leads to a glitch colloquially known as a wallswim. Adding a tile at position x5y9 ought to fix this. The subterranean area is quite tricky and could use at least one save point (maybe on x998y1003 as it seems possible to get stuck if going right instead of left on the screen below). In general I feel save points are a bit sparse in your level, but most people tend to disagree with me when I say things like this so don't feel pressured to add a whole lot more. Using double jump / umbrella, it's possible to reach void screens at x998y997 & x999y997. Maybe you could extend the cliff out more or build a secret area there, something like that! Likewise, if you climb the red door wall after getting double jump / umbrella but before getting the red key, you can reach a void screen at x1002y998. You may have to build an actual ceiling. This level is too good to not have an info screen. If you take Scene1.png from your Intro folder, rename it Info.png and put it in the main folder, I think it looks really good with the menus. You could then also delete the Intro folder and the level will just start directly, which is something I personally like. I noticed you mixed up the author and level name fields when you first made the level. Happens to me more than I'd like to admit. You changed it in World.ini which is great, but you can also rename the directory from 'MysteryIsland - RelicShine' to 'RelicShine - Mystery Island'. The typical way of distributing Knytt Stories levels is as knytt.bin files, which can be created using Level > Compress in the editor. Apparently this only works natively in Windows, just in case that's an issue you ran into. After you've done all this, you should submit it as a game to this event. Glorious Trainwrecks accepts knytt.bin files, so you can just upload it directly. Include a screenshot, too! OK! That's all I have to say. I really hope you keep making levels! Love the feedback! i'll certainly use your list to update the level. I have a couple of things i'd like to add too. 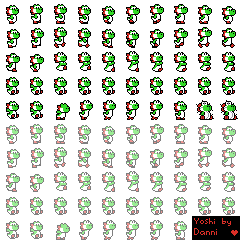 Hmm, I need to find a use for this Yoshi knytt skin I made back in like February. Guess I'll be using it in the level I make for this event! Oh yeah, I can decompress Knytt Stories levels but I can't compress them, so if someone could compress my level when I'm done with it that'd be great. Hey, as it turns out, I can compress levels after all! I guess something in Wine got fixed? Anyway I'm gonna upload my level now. Here is the skin if anyone wants to use it. I would appreciate credit. Remember that player skins need Knytt Stories Plus for them to work. Oh geez, I only just now realized that thing to the left of Yoshi is meant to be a ceiling light. I always thought it was just some weird sculpture to put wherever. I'm having a hard time adding music to the Ambiance or the Music assets. I made a .ogg file, named it Ambi255.ogg, placed it in KnyttStories/Worlds/My level name/Ambiance, and when I flip through AtmosA or AtmosB to 255, I get an error and here no sound. edit: Nevermind, I got it working once I got the Knytt Stories Manager working and added it with the Custom Data Manager. Also the Knytt Stories Manager crashes on me. I can't open it at all. edit: Never mind, I used the Windows compatibility-mode tool and it fixed it! I've never used that before, it's pretty cool. Is there an easy way to determine whether or not a creature in a bank is friendly or death-touchy? Or do I just have to test a zoo and learn from trial and error? It's not complete, but it might save you some time. 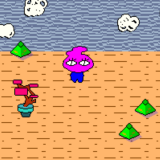 Also, all objects under the "Meanies" category are hostile, while all objects in the "Knytt & Fluff" bank should be harmless (as far as I remember). Another visitor from the Nifflas forums here! I decided to give this a shot and made a tiny and incredibly dumb level just for the heck of it, in approximately two and a half hours. gonna do this even though i haven't used the knytt stories editor in like 6 years!!! I didn't finish a game today, but I just have to tell y'all: Knytt Stories is a really good engine for me right now and it's not because I like platformers. The included audio and visual palettes are a great way for me to quickly experiment with aesthetic techniques in games in general. The more time I spend with this engine, the more I can see how it will help my understanding of visual, auditory, and path design. Making a single screen that feels complete is a certain kind of satisfaction that I was craving in the exercise of game-making.